Suitable to use from from newborn to toddler. Single spring weight limit = 12kg. Double spring weight limit = 24kg. own small movements, instead of the abrupt arousal often experienced in a cot. 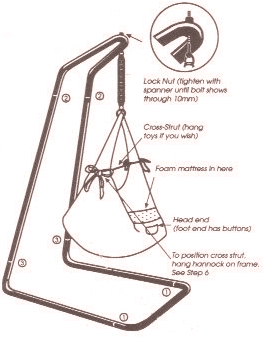 The hammock is connected to the frame by a bolt and lock nut. To safely secure the bolt to the frame, the lock nut should be tightened with a wrench or spanner until the threaded part of the bolt shows through about 10 mm (1/2 inch). Once in place, the lock nut should never be removed. If removed, the lock nut should be replaced with a brand new one. Max load weight with standard spring (provided) - 12 kg. A second spring can be purchased and used alongside the existing spring to hold up to 24kg. Hammock, sheets and mattress cover should be hand washed in mild detergent and drip dried.